Abstract : Through the research on the status quo of packaging waste produced in the final disposal site of domestic municipal solid waste in China and the life cycle analysis of several typical packagings, it is concluded that the focus of packaging and recycling management in China should be plastic packaging, and that Vigorously strengthen the clean production requirements for packaging manufacturers. Life Cycle Analysis (LCA) is a tool used to evaluate the impact of products on the environment throughout the entire life cycle, from the acquisition of raw materials, the production and use of products to the disposal of products after use. Technology and methods. Life cycle analysis is an analytical tool that helps people make environmental decisions about how to change products or how to design alternatives, that is, cleaner products are made from cleaner processes. After decades of development, this method has become an important support tool for environmental management and product design in many countries and enterprises. On the government side, life cycle assessment is mainly used for the formulation of public policies, the most universal of which applies to the identification of environmental markers or ecological standards. Many countries and international organizations require life cycle assessment as a method of establishing marker standards; they can also be used To formulate policies, regulations and stimulate the market. The adoption of life cycle analysis methods by enterprises can increase the characteristics of their products that are conducive to the environment and thus increase market competitiveness. At present, the application of life cycle analysis in China is still in its infancy, but with the development and development of cleaner production, green products, and eco-labels, it will further promote its rapid development. This study presents useful suggestions for the management of packaging recycling in China by analyzing the status quo of the production of packaging waste in the final disposal site of domestic municipal solid waste in China and the life cycle analysis of several types of typical packaging. In this study, samples of domestic waste are collected from cities that have different living standards and geographical characteristics (Beijing City, Jiujiang City, Jiangxi Province, etc.) in the final disposal site for household waste, and the wastes in the collected waste are manually selected and sorted according to their materials. After classification, the quality of the waste was weighed separately; the total mass of domestic waste was also taken. It mainly investigates the production of major packaging wastes such as plastics, glass, metal, paper, wood and bamboo. The total mass of household waste examined in the final disposal sites of municipal solid waste in Beijing and Jiujiang cities was 150 kg (Beijing) and 310 kg (Jiujiang) respectively. Among them, the largest number of various types of packaging wastes are plastic packaging materials, which account for 88.80% (Beijing) and 75.04%, respectively; the second largest proportion is composite flexible packaging (Beijing) and glass packaging. (Jiujiang) accounted for 5.76% and 14.36% of the total packaging waste. If waste glass, plastic, and composite flexible packaging are added together, they will account for 97.0% of the packaging waste, respectively. O8% (Beijing) and 89.99% (Jiujiang) accounted for the vast majority of packaging waste. It should be noted that the number of various plastic bags in the plastic packaging of the disposal site is large, accounting for 57.15% (Beijing) and 56.88% (Jiujiang) of the total package quality. In other words, if the various plastic bags can be recycled well, about half of the packaging waste can be reduced. The "Cleaner Production Promotion Law" requires the national economic and trade authorities to formulate a catalogue of compulsory recycling packaging. Given that China currently does not have a uniform and standardized packaging waste recycling network across the country, it is not realistic to recycle all types of packaging waste once and for all. In addition, there are significant differences in the recycling of different kinds of packaging wastes (some types of packaging such as metal packaging can already be completely recovered in existing recycling systems). Therefore, the appropriate method for setting up a catalogue is to gradually incorporate it into the scope of management according to the current situation of the recycling of different types of packaging and its impact on the environment. The current object of management should be plastic packaging, glass packaging, and composite flexible packaging that cannot be properly recycled in existing recycling networks, and the focus is on plastic packaging. In this study, several types of typical packaging (plastic, glass, and composite flexible packaging) were investigated in the previous survey, and their environmental impacts throughout the entire life cycle were analyzed. 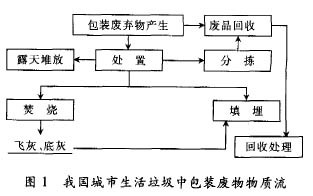 The material flow process of packaging waste in urban domestic waste in China is shown in Figure 1. The main life cycle stages examined in this study include: the extraction phase of raw materials, the material preparation phase, the packaging manufacturing phase, the packaging use phase, and the packaging waste disposal phase. The scope of the study is shown in Figure 2. In several types of packaging, plastic packaging research objects include LDPE, HDPE, PP and PET packaging; glass packaging research objects are mainly glass bottles and cans, of which 10% reloading; composite packaging is the study of beverages Paper-plastic composite flexible packaging. The evaluation unit is 1 kg package. Any custom request of shape ,size and material is available ,MOQ:1 SET ! 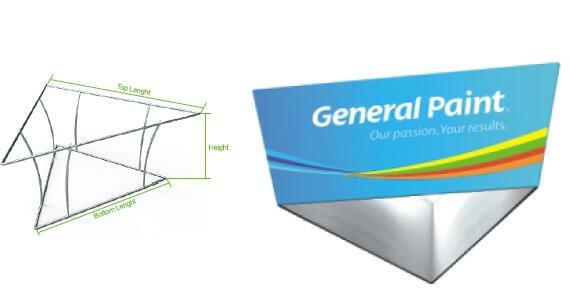 Handing display banner is one of the hot selling trade show equipment and widely used for various events to make promotions smart & eye catching .Aluminum frame is packed in folding sections,lightweight,portable and easy to set - up.